When I was gathering supplies to make the picket fence planters last week, I ended up getting entirely too many clothespins. I don't know if this is a serious problem or not, but it's like they were bunny rabbits and multiplied in the drawer when I wasn't looking. So I decided to use them up and decorate my laundry room a little at the same time. Because everybody needs art in their laundry room, right? I thought so. 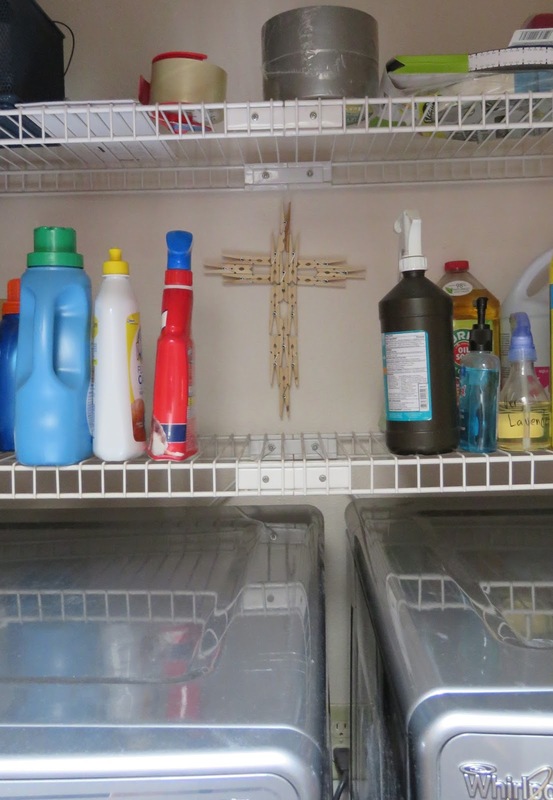 This clothespin cross is literally the easiest craft project I have done in ages, despite the fact that I touched the hot glue gun with my hand and it blistered. Other than that, it was a lot of fun. Lay out your pins in your desired shape while your glue gun is heating up. When you start gluing, use the rule of thirds as your guide - the metal spring as your marker. Run a good-sized bead of glue down the side you'll be attaching and quickly stick them together. The glue will dry incredibly fast on the wood, so work as efficiently as you can. Let each one set up before you go on to the next one. My cross is laid out in sets of three, so I did a section at a time and then adhered all of the sections together. Working on a piece of paper keeps the strings of glue off your work surface. When it's all done, let it set for a while before you try to pick it up. There are a few places where mine is just attached by the tips of the clothespin, and I wanted those to be strong and tight before hanging it on the wall of the laundry room. All you need is a long nail to hang it up.